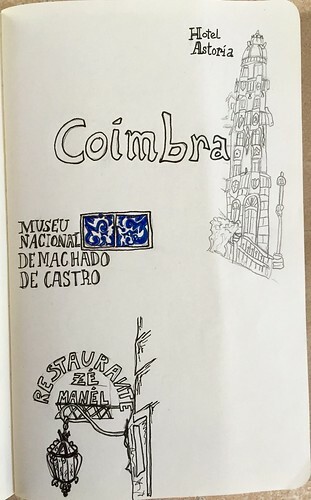 Today's story is from Lorraine Kasyan who shares her sketchnoted travelog. 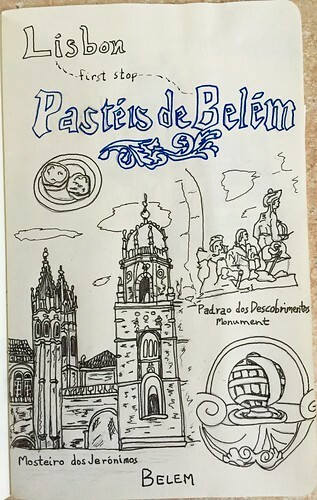 Visiting Portugal gave me a unique opportunity to try my travel sketchnoting skills. Always so eager to capture ideas in doodles, I hoped to capture the feel of each place we visited as well as the impressions it left on me. I purchased small moleskine soft cover books, and two Pentel Energel .7 mm ball pens for my son and me. My son brought along two mechanical pencils and his willingness to join the fun. The activity did not disappoint. 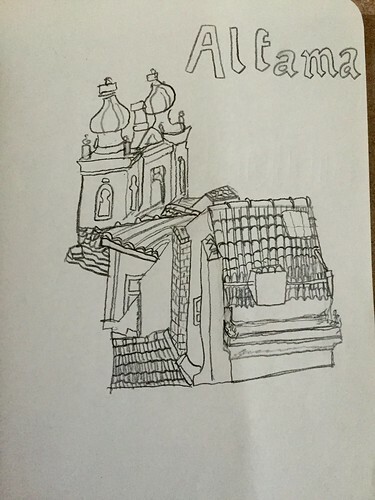 It was easy to be enthralled and captivated in Portugal. The country is gorgeous, the architecture otherworldly, the people smiling and animated, and the food delicious. Staying present and noticing my surroundings was the easy part. Stopping to sketch them was a bit more difficult as we traveled mostly by foot and navigated cobblestone streets, steep hills, and miles of wrong turns daily. We were able to sketch on site a few times and then in the evenings we would look at photos of the locations in those starter sketches and add detail. Detail! As hard as I tried to stay open and general, the details really called to me. Every location, side street, castle, and church had so much to see that in each square foot was a universe to behold. Faces and animals, angels and tile work that took my breath away. I couldn’t help but add some rudimentary detail and thus did not draw as many different images as I originally planned. 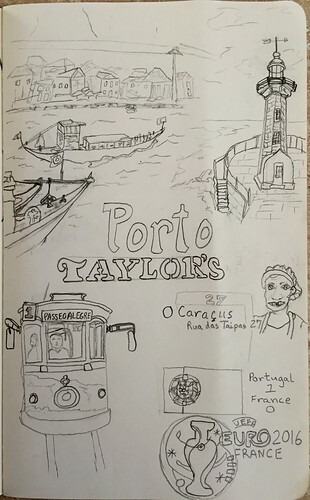 I created one sketch for each location visited in my travel journal and selected something particularly memorable from each. Then, I created the overview or summary sketchnote to help me remember the key points, locations, and memories of our ten days. That summary sketchnote is here above and you can find the sketches on Flickr. Portugal was pure magic. We experienced so many coincidental events, chance encounters, and heart felt connections while there. Really. Feast days, a parade, a guitar concert in closed convent, the kindness of strangers and the Euro Cup. Yes, we were there for the last two games and celebrated the win with a crowd of Portuguese enthusiasts on a grass-topped restaurant with ancient olive trees growing in our midst. The win was a surprise to all and the night one to remember. I look forward to seeing your travel journals soon – It really made an amazing trip much more memorable. Capture those impressions and share with us. Thank you so much for sharing your experience. Lorraine! I particularly love the summary, I think is a great way to recap the trip and to consolidate the experiences.